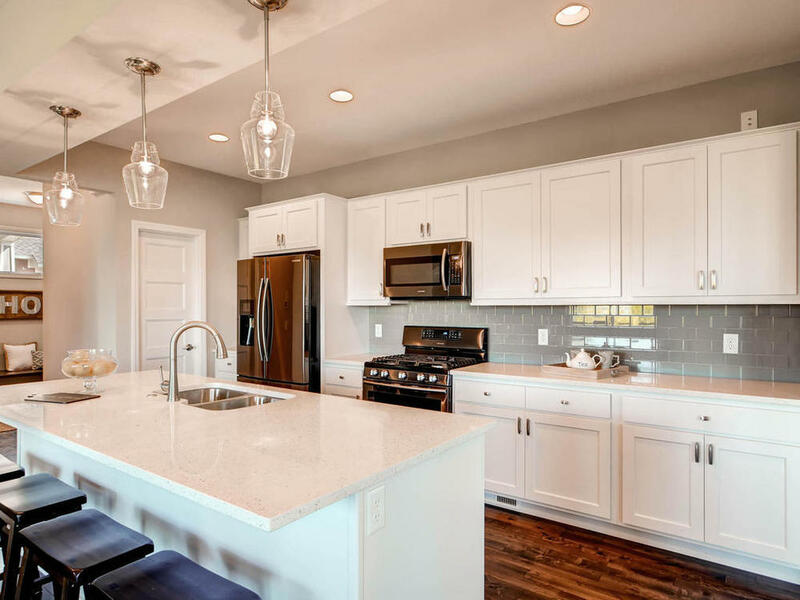 New Construction with Exceptional Craftsmanship is the Heart of Thorson Homes— a Family-Owned, Father & Son Construction Business for over 35 years. The Curb Appeal of this Home is very inviting with the two toned color scheme siding to the rich accent of the brick entrance. Landscaping & Perennials are showcased in the front yard for beauty and easy maintenance. The flat backyard is a bonus for the entire family -- perfect for deck, fenced in yard, swing set, bonfire pit, patio or just leave as is! Inside the home you are greeted with the beautiful hardwood floors and 9ftCeilings. Lots of windows provide the natural sun light for the living room, dining & kitchen area. Cooking & Entertaining is a dream in this kitchen. Awesome Island to gather around, High Quality Appliances and lots of cabinets for storage make this kitchen efficient and gorgeous to show off your cooking skills. 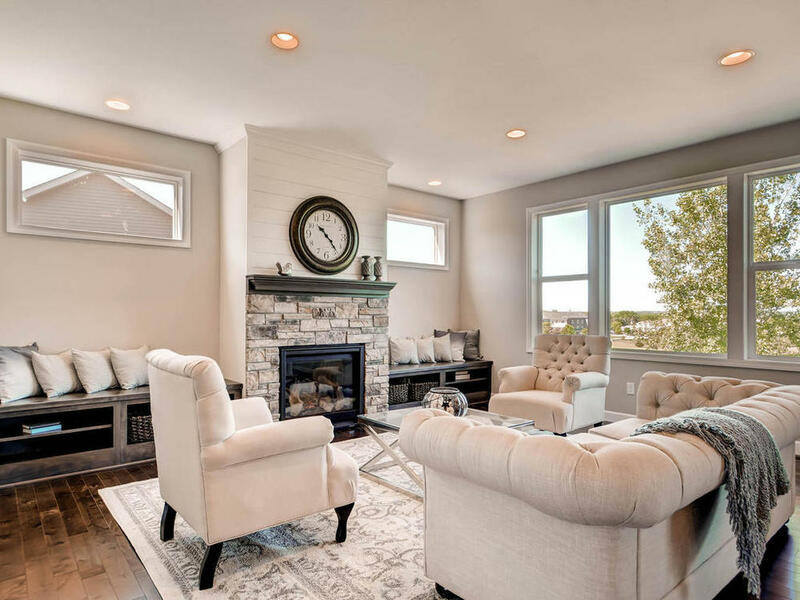 Cozy up to the stone gas fireplace and relax in the living area. Retreat upstairs to the Master Suite & Private Master Bath to relax & unwind. Dual vanity is perfect for hectic mornings, custom tiled shower and walk in closet. The upstairs also has 3 other bedrooms along with another full bathroom plus laundry room. Lower level has a Finished Family Area with a walkout to the back yard -- this is great for kids(teenagers enjoy their own space) 5th Bedroom and 3/4 Bathroom. No disappointments in this home ..... Beautiful Warm Color Palette and Custom Lighting completes this home with the perfect finishing touch! Lakeville is a city in Dakota County. It is a suburb of Minneapolis, approximately23 miles south of downtown. On the Twin Cities metropolitan area's southern fringe, Lakeville is one of the fastest-growing cities in the Minneapolis–SaintPaul metropolitan area. Lakeville has many recreational opportunities. The Parks & Recreation Department maintains a total of 62 public properties, including neighborhood and community parks, athletic fields, playgrounds, greenways,trails, tennis courts, skating rinks, picnic areas, conservation areas, nature areas,several public fishing areas, swimming beaches, the City's Central Maintenance Facility, Senior Center, and the Lakeville Area Arts Center. Lakeville is located in District 194. The district boundary covers 86 square milesand includes Lakeville, Elko, part of Burnsville and rural Credit River, Eureka and New Market townships. District 194 has eight elementary schools (grades K-5), three middle schools (grades 6-8), and two high schools (grades 9-12). District 194 offers preschool, ECFE, before and after school care, and general youth & adult classes. Lakeville Area Public Schools is a partnership of students, families, staff, and community committed to excellence. Thank you! Please follow the link to download the school informtion.